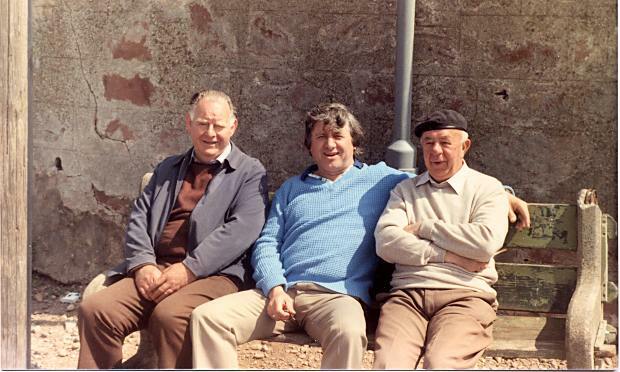 Bobby Hogg, Eric Thomas and Ernie Shepherd enjoying the afternoon sunshine on the bench at the bottom of Bank St.
"Sure that's not Jimmy Tarbuck in the middle!" Now now Roy he may be your brother but he' s my mate and a proper gentleman. Don't you be saying he looks like Jimmy. Hows you doing anyway. I am prevented from sending a link to an article in the Scotsman about Bobby and Gordon Hogg and the Cromarty dialect. I clicked on 'Bobby Hogg' and I assume this the Bobby Hogg that is mentioned in the article that my friend, Mary sent me the link to. I tried to respond to the thread, but it was closed by the time I could access it. I remember my Cromarty Granny, Ina McLeman's dialect. I only spent my summer holidays with her and regret I didn't learn more. "Oo thee keepan?" and "At now kucka?" are phrases I remember. Please don't this this dialect/language/heritage die. I care deeply about this and have had an article published in 'lallans', the journal of the Scottish Language Society. ut now margaret, oo thee doin muttal, seein the bit aboot bobby an gordon in the p&j minded me aboot the time john rae pit me oot till trim the edge in front of the school, i wis clippun away, when their bouba came bye and said "ut thee dein byoch" when i telt um, he said thats no the wye till dee ut, haud muttal an i'll show thee, he cut three bushes back till about a fut off the grun sayun, noo byoch, ats the wye till prune, i thoct it was a wee bit drastic but must be the right wye and carried on wi the rest o the bushes.when rae cam oot he went oot o his trottums and i got the belt, i didna clype on ould ogg though, bit i lernt the differance between prunin and trimmin. I so enjoyed your account of prunin an trimmin. I'm sorry you got belted for doing your best. Teachers were sometimes quicker with the belt than actually teaching. I now have Skype installed and am looking forward to a blether. Headphones sit on my desk. Apart from that - I have no idea how it works - and Richard is on a business trip - but I'm sure I'll figure it out. I've heard that my Granda's Dad was a fearsome man, and from Ian's story above it would seem to be true! I can't tell you how proud we were when the articles about Granda and Uncle Gordon were in the news, my (late) Granny said that the phone rang itself off the hook for days, people from all over the world wanting to know about it. Ernie shepherd was my grandfather. A great man, and it's made me so happy to see a picture of him enjoying the company of friends in his hometown Cromarty. It's the first time i've seen an image of him since he passed away about 14 years ago.